When Vanderhall MotorWorks needed a car parking lift to store their unique 3 wheel cars, they contacted ASE deals.com. We set them up with 2 of our BendPak PL6SR Auto Stacker car parking lifts. 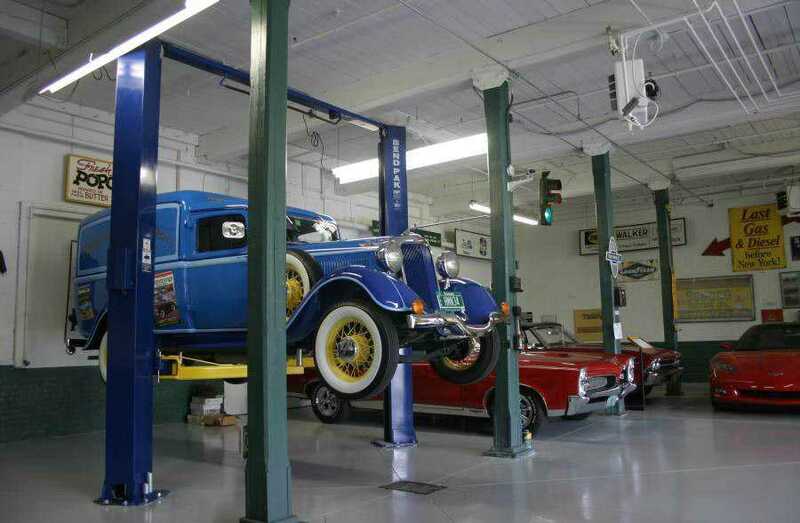 Check out this video they shot below showing the two auto lifts we supplied them in their garage storing their really cool automobiles on and under them. There are currently two different Auto Stacker lift models to choose from. The wide model is about 8 inches wider. Both models should accommodate most typical passenger cars on them and under them. The wider model will be more suitable for wider full size SUV’s and pick ups. Both are rated at 6000 lbs lifting capacity, and both offer a full bottom deck that allows you to park all kinds of vehicles up on top, not just traditional automobiles. So you’ll be able to park almost any type of vehicle onto this platform, such as lawn tractors, ATV,s and even 3 wheeled cars like the Vanderhall automobile. The deck is ultra low profile too, so you can drive even most of the lowest lowered sports cars out there today without worrying about bottoming out. Plus, it raises to a full lifting height of 88 inches, so if you have a taller pick up truck you need to store underneath, no problem! ASE was at the 2018 SEMA automotive show in Las Vegas to view the AutoStacker lifts on display, with many cool sports and exotic cars on and under them. Many home / hobbyist customers find this type of scissor style automotive storage / parking lift more practical than the more common four post car lift, as it occupies less floor space, and you don’t have to deal with those four large columns getting in your way. Plus, the 4 post lifts typically don’t feature a solid deck. They typically have two runways and an open center. Many commercial parking facilities also choose this style of storage lift for it’s convenience, safety and ease of use. It operates on a 2 HP motor , 220 VAC. We’ve even got a ceiling height calculator if you’re not sure if you have enough ceiling height to store one car over another in your garage. Click here for ceiling height requirement calculator. So if you’re on the market for a fun to drive and cool new sporty little 3 wheeled car, check out the Vanderhall cars. They’re quite different from all the others out there currently, and they’re also a bit more affordable than the competition as well. View from the driver’s seat, or cockpit of the Vanderhall Speedster 3 wheel car. Just imagine how much fun it would be to drive this cool vehicle around town on a warm summer day. 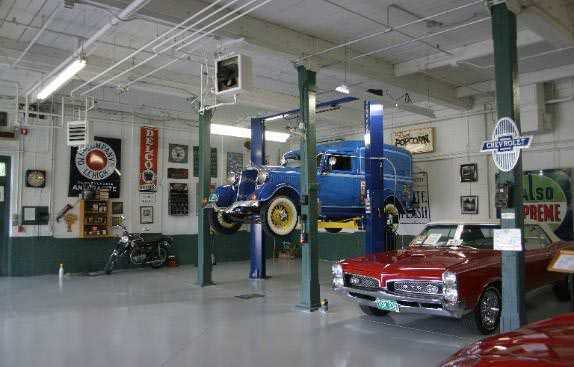 Or, if you need more garage storage space for your classic automobiles or antique cars, and you don’t want to pay a storage facility to hold them for the winter, or if you don’t want to spend an obscene amount of money to add on to your garage, check out our Auto Stacker car parking lifts by BendPak as a more affordable alternative. Contact us today at 800-229-6218. And remember, we sell, service and install nationwide. So what are you waiting for? Get in the game! Who wouldn’t want to have an automotive shop in the Bahamas? As long as there is air conditioning in the garage! We recently sold a laundry list of automotive shop equipment to a customer in Nassau, in New Providence in the beautiful islands of the Bahamas. This new customer purchased many different pieces of automotive equipment, including transmission jacks, bearing presses, car battery jump starters, floor jacks and many other items. Most notably, two pieces that any auto shop worth it’s salt could not do without – a couple of 2 post lifts and an air compressor. The two post lifts were an easy choice for the shop owner. They chose the BendPak XPR-10A automotive lift for it’s features, versatility, quality, and value. It is our most popular model. It offers a wide range of features, such as the ability to be set up at a wide, or a narrow configuration, and also has a rare ability to position the auto symmetrically, if it won’t balance out properly in an asymmetric setting. Add the quality of construction, such as taller lift carriages, superior arm restraints, along with double diameter equalizer cable pulley sheaves, and you’ve got a premium car lift at a very reasonable price. All this, and it’s even certified by the highly respected Automotive Lift Institute. You’re going to need an air compressor in any professional garage. and who better to supply your automotive shop air compressor than BelAire? These guys are the best at it, and that’s why we recommended the model 218V. This is a 5 HP compressor with an 80 gallon tank. It’s made in America while so many others aren’t. Plus, there is a 2 year warranty on every component. Along with that, they have over 350 service centers across the country. While our customer base is mainly here in the good old USA, we also sell lifts and automotive service equipment to auto shops, home hobbyists, gear heads and weekend warriors all over the world. One location that we enjoy selling to is the beautiful islands of the Bahamas. Actually, the Bahamas were where Columbus first landed in 1492. There are actually more than 3000 islands that make up the Bahamas, but the most densly populated is the island of New Providence. This island features the capitol city of Nassau. Nassau has been a huge tourist attraction for many years. This week’s customer is German Auto Works from the city of Nassau in the Bahamas. We had the opportunity to visit with them recently. They just opened a brand new auto shop that specializes in European automobiles. They actually purchased several BendPak Lifts from us. They bought an XPR9 floorplate two post lift, and an XPR10A clearfloor two post lift. The clearfloor model is an asymmetric lift. The asymmetric style of lifts allows you to get your door opened wider after you have parked the car in between the posts. Most technicians prefer this style of lift these days. The added benefit of the BendPak design is that it can also position the auto symmetric as well. This lift is truly the best of both worlds, and is yet another example of why BendPak is the premier name in car lifts. The XPR9 is a floorplate model, meaning that it will fit under shorter ceiling heights.. No matter what you need, BendPak and ASEDeals.com have got you covered. If you have the opportunity to visit Nassau, Bahamas, we highly recommend it. Check out this sweet ride on our BendPak XPR9 two post lift. This picture was send in to us by a customer. The customer is Susan Ashborn from Bristol, CT. She purchased this lift from us recently and send in some photos to us to show off her lift and her beautiful car. This is what people do. They like to share images for their pet project cars along with one of our car lifts. The XPR-9 two post lift is a floorplate style hoist. Every two post lift has equalizer cables as well as hydraulic lines that must run across from one column to the other. They need to place them in one of two locations, either along the floor, under a plate of steel, (hence the term “Floorplate”) or at the top. When they run at the top, they are called clear floor lifts. Clear floor lifts typically stand at about 12 feet tall, so you would need to have adequate ceiling height. If you don’t, you would need to get the floorplate model. The floor plate sysle lifts are made for shops with ceilings that are too low for the clear floor lifts. Most folks tend to prefer the clearfloor lifts provided they have enough ceiling height. They prefer a clearfloor model because the floor plate acts like a speed bump. It make it difficult to roll items across the floor underneath the lift. Things like transmission jacks, tool carts, oil drains, etc. are difficult to get over the plate. It still can be done. The plate is only 1.5″ high in most cases, and it is ramped up on each end. But it is more difficult. Another key difference is that the clearfloor 2 post lift has a shut off bar at the top. The switch gets activated when the roof of the car hits it. Of course, a floor plate model does not have a shut off bar at the top, so the user must monitor the vehicle as it’s being raised to make sure it doesn’t go into the ceiling above. After this brief two post lift tutorial, you hopefully have a better understanding of the two different styles. There are many other factors involved in choosing a twio post lift. You can find them in other past posts on this blog. Here we go again. We constantly receive new pictures from customers each week showing us their new lifts that they have purchased from us. And we love getting them. It gives them a sense of pride in showing off their new lift as well as their sweet ride, or rides. And it gives us the opportunity to get feedback from them. We want to hear all feedback – positive or negative. We need to hear from you. It just simply helps us to serve you better. This post features a picture and testimonial from a customer from West Hampton, MA. He purchased a BendPak XPR-10A two post lift.This is an asymmetric lift that also has the capability to position the vehicle symmetrically as well if needed. This feature comes in handy when you have a rear heavy vehicle, like a car with the engine in the rear, or a service van with lots of equipment in the back, as well as extra long trucks, like a crew cab dually. Hey Guys, My car is in the air! Great lift. No issues with install. Please feel free to use any or all pictures of my XPR-10A 10,000 lb. lift. Thanks again. And the winner is…. Larry Hughes from Worthington, OH. Larry purchased a Bend Pak PLT-6S Tilt Platform Parking Lift. Larry said, “Just got the PLT-6S parking lift up and running. One word – Awesome! Attached are the pictures from my garage. Thank you”. This lift is a new model that BendPak recently came out with. They design and fabricate many different types of service and parking lifts. This model is pretty unique and solves the nagging lack of garage floor space issue. It allows you to park one vehicle over another, virtually doubling your available parking capacity. Each style of parking lift has it’s own unique advantages. This lift allows you to utilize all available space, particularly for folks who don’t have a lot of ceiling height. You can win our drawing too. All you need to do is submit a picture or two of your lift that you purchased from us within the last year. It must be installed and set up in your shop or Garage. That’s what Larry did, and now he is the lucky recipient of the ES2500 by Booster Pac. This is one of our most popular car jump starters. The Booster Pac name is widely known among professional circles as a leader in the car battery jump starter industry. Customers who are on the market for an alignment lift should take a look at our XR12AE Scissor Alignment Lift by BendPak. If you want more than just a typical four post alignment lift, then you should check out this great deal we’ve got going on right now. The regular price for this lift is $11,920. The sale price is $10,528. That’s a $1392 discount. The reason for this discount? The XR12AE is being replaced by a new model lift, the XR12000A. The new lift is similar to the old model, but has a few new cool features, like the fact that is it raises straight up as it scissors up, while the XR12AE lurches forward slightly as it raises. The new model has slightly longer runways as well, allowing you to align extended cab full size trucks. But the XR12AE is still a great car lift, and at this close-out price, you can’t go wrong. But there is a limited supply of them. So don’t wait, because once they’re gone, they’re gone.